MEDORA, ND: Theodore Roosevelt National Park and Historic Medora invite curious minds of all ages to celebrate North Dakota’s dark night skies. 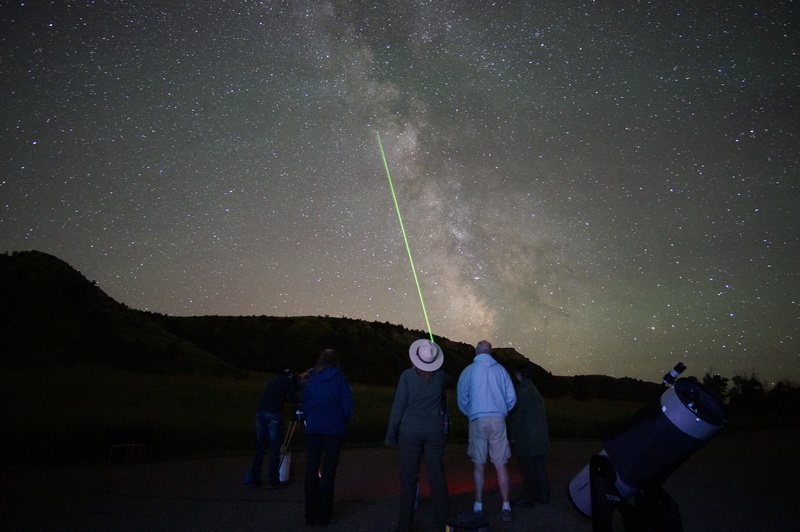 Park rangers, astronomers, and space enthusiasts of all types will gather for the Fourth Annual Dakota Nights Astronomy Festival Friday, September 23 through Sunday, September 25. Daytime activities include model rocket building and launching, a “build your own telescope” workshop, “sun gazing,” solar system hikes, family astronomy activities, and hourly presentations in Dickinson State University’s Discovery Dome. As a special offering this year, the park is proud to host NASA lunar samples! Visitors are welcome to enjoy presentations by nationally recognized speakers at 7:00 p.m. MDT each evening at the Cottonwood Campground amphitheater. Afterwards, astronomers will reveal the mysteries of the universe while star gazing in a field of more than a dozen telescopes at Peaceful Valley Ranch. Dr. Tyler Nordgren, professor of physics and astronomy at the University of Redlands, artist, photographer, astronomer and night sky ambassador, will make the featured presentation “Come for the Stars, Stay for the Sun” on Friday, September 23. Dr. Joe Shaw, Director of the Optical Technology Center at Montana State University, will be the featured presenter on Saturday, September 24. Dr. Shaw will present “Optics in Nature” at 3:30 p.m. MDT in the auditorium of the North Dakota Cowboy Hall of Fame (250 Main Street, Medora); at 7:00 p.m. he will discuss the Aurora Borealis, a presentation that will include beautiful photographs of this night sky phenomenon. Dr. Paul Barnhart of the Department of Natural Sciences at Dickinson State University will make the featured presentation; “The Importance of Darkness: Bat Ecology and The Impact of Light Pollution on Wildlife” on Sunday. The Dakota Nights Astronomy Festival is a partnership between Theodore Roosevelt National Park and Historic Medora. “Dakota Nights Astronomy Festival would not be possible without our partners and the many volunteers who join us in celebrating the night sky,” said Andes. Partners include Medora Area Convention and Visitors Bureau, Medora Chamber of Commerce, Theodore Roosevelt Nature and History Association, Dickinson State University, Friends of Theodore Roosevelt National Park, Chateau De Mores State Historic Site, North Dakota Cowboy Hall of Fame, Custer’s Cottages, and the Ramada Grand Dakota Lodge in Dickinson. All festival events are FREE. Park entrance fees apply on Friday and Sunday. National Public Lands Day is Saturday, September 24, and entrance fees will not be charged. A complete listing of all activities and an event map are available on the park’s website at www.nsp.gov/thro.